Upgrade your living space into a smart home without breaking the bank with our hand-picked smart home devices that include speakers, security cameras, light bulbs and more. Create a smart home hub with these gadgets that work with Amazon Alexa and the Google Assistant to simplify your technology and help make your day-to-day life even easier. 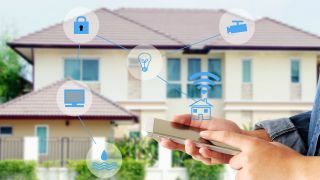 Whether you want to personalize and control your lighting, stream music and videos or secure your home, we've found a variety of top-rated smart home gadgets to help you get started building your smart home. Most of your products work with Alexa or the Google Assistant so that you can control the devices with the command of your voice. We've also included the Aukey Smart Plug-in our list which gives any device you plug into smart capabilities. Read on for our list of the best smart home gadgets that include the best prices and deals that are currently available. We have a variety of devices that will fit all smart home needs and budgets. The best-selling Echo Dot is a voice-controlled smart speaker that works with Alexa to make calls, answer questions, set alarms, check the weather and so much more. The compact smart speaker can also control your compatible smart home devices with the command of your voice. Just ask Alexa to find TV shows, turn on lights, adjust the temperature and more. You can use your voice to play a song or artist through Amazon Music, Apple Music, Spotify, Pandora, and others. Alexa has over 50,000 skills so you can discover new skills that will help you with everyday tasks. The Amazon Echo smart speaker can play music, answer questions, set alarms and more all with the command of your voice. You can also control your other smart home devices with the Alexa-enabled speaker just ask Alexa to turn off the lights, adjust your thermostat, lock your door and more. The Echo can make calls and send and receive messages through the hands-free speaker. The smart speaker features a better audio experience than the Echo Dot offering a powerful audio with Dolby technology built in to the speaker. Control your lighting from anywhere with the TP-Link Alexa-enabled light bulb. You can turn your lights on and off and adjust brightness with your tablet or smartphone using the Kasa app. You can connect the smart bulb with Alexa or Google Assistant devices and use your voice to control your lights. The easy-to-install light bulb can transform into any color to set the mood and personalize your lighting by adjusting brightness as well as light appearance from soft white to daylight. The TP-Link bulbs will also help you out with your energy costs by reducing energy use up to 80% without brightness or quality loss. Turn your electronics and appliances into voice and app-controlled devices with the Kasa Smart WiFi plug by TP-Link. The smart plug works with Alexa and the Google Assistant so you can turn your devices into a hands-free experience. You can turn on lamps, appliances and more from anywhere on your smartphone using the Kasa app. You can also schedule the smart plug to automatically turn on and off when you're away and reduce your energy by managing devices that use the most power. Help secure your home with the Ring Video Doorbell Pro that allows you to answer your door from anywhere. The Ring Pro works with Alexa and will send alerts to Echo devices which allows you to hear and speak to visitors entirely hands-free. The Ring Video Doorbell Pro also sends alerts to your smartphone when motion is detected or when someone presses the doorbell so you can monitor your home from anywhere. The Pro features advanced motion detection with a camera view that generates motion alerts within user-set motion zones. The Ring doorbell connects to your existing doorbell wiring so you don't have to worry about re-charging the battery and features four different faceplate options. Control your thermostat from anywhere with the 3rd generation Nest Learning Thermostat. The smart thermostat uses technology to learn your habits and adjust automatically to help save you energy. On average the Nest thermostat saves 10-12% on heating bills and 15% on cooling bills so the Nest will pay for itself in no time. You're able to control your thermostat from anywhere with Nest app using your phone, tablet or laptop. The smart thermostat also works with Alexa so you can adjust and control the temperature with the command of your voice. The Nest thermostat features a thinner and sleeker design than previous models and comes in four different colors. Clean your floors with the command of your voice and completely hands-free with the Wi-Fi connected iRobot Roomba Robot Vacuum. You can use the iRobot home app to clean and schedule your vacuum from anywhere and receive notifications when the job is complete. The Roomba 960 can continuously clean for up to 75 minutes and will automatically recharge. The robot vacuum features a three-stage cleaning system and a high-efficiency filter that captures 99% of allergens, pollen, and dust. The Roomba is also compatible with Amazon Alexa and the Google Assistant so you can control the vacuum with your voice. Keep your home secure with the Arlo Pro two camera security system. The top rated security system includes two cameras, rechargeable batteries, power adapter and cable, wall mount, and a base station. The Arlo Pro cameras are weatherproof so they can be used indoors or outdoors and can operate in up to 122-degree temperature. The 100% wireless Arlo Pro records video in 1080p HD resolution and offers advanced motion detection to catch every angle so no moment goes unnoticed. The security system also has a smart siren that can be controlled remotely, or when motion or sound is detected. The security camera works with Alexa, and has a compatible app which allows you to monitor your home from anywhere. The top-selling Anova Sous Vide lets you master the hottest cooking trend, sous vide. Just fill a pot with water, set the desired temperature and time, and cook everything (meat, souffle, carrots) to perfection. The Anova Sous Vide allows you to prepare restaurant quality meals by cooking your food at the precise temperature and not ever having to worrying about over-cooking. You can set the time and temperature manually on the device or through the Anova app. The app allows you to cook remotely, so you don't have to wait around in the kitchen waiting for your food to cook. The app also gives you access to over 1,000+ creative recipes and guides you through each recommended meal. Build your smart lighting hub for your home with the Philips Hue White and Color Ambiance Starter Kit. The Philips starter kit includes three 60W white and color ambiance A19 bulbs, one Hue bridge, ethernet cable, and power adapter. The Hue hub is compatible with Amazon Alexa and the Google Assistant so you can control your lighting with your voice. The Hue color bulbs allow you to choose from sixteen million colors in the Hue app to set the perfect mood and create a unique and personalized lighting experience. The Hue app also lets you sync your lighting with movies and music and allows you to control everything remotely. The Hue hub will enable you to add on to your smart lighting system with the bridge accommodating up to fifty Hue lights. Secure your home the smart way with the Schlage Connect Touchscreen Deadbolt. The Schlage connect features a touch screen keypad which allows for keyless entry. This lets every member in your family have their own 4-digit code that will be easy to remember. You can also create temporary codes for visitors and never have to worry about replacing locks or exchanging keys. The Schlage Connect is Z-Wave compatible and connects to your home automation system which allows you to lock or unlock your door remotely. You can also use your voice to control the lock with any Amazon Alexa compatible device. The deadbolt features a built-in alarm that comes in three different modes that will alert you when someone is coming or going and communicate any potential security threats. The Logitech Harmony Elite Remote is the ultimate universal remote that not only controls your TV but can also control other smart home devices. The Harmony remote works with Alexa so you can use your voice to control your TV and other connected devices. The remote features one-touch automation so you can touch one button to trigger everyday activities like turning on the lights and TV. The Harmony Elite also works with other smart home devices, offering single-touch control with smart lights, locks, thermostats and more. The universal remote lets you combine up to fifteen remotes and several apps into one easy-to-use remote so you can control all of your electronics and gadgets with one device.